wow Halloween has come around so fast this year. I don't believe its near enough November already?! I love Halloween, the dressing up, the sweets and the parties but what I don't like is the blood, guts and gory stuff and being scared haha defeats the point I guess but oh well. I still dress up, I just don't rip the living daylight out of everything I'm wearing and I don't cover myself in yucky, sticky fake blood, I actually couldn't think of anything worse. So here I am, all dressed up for Halloween, minus the blood and guts. I'm actually loving this maid outfit as it had the longer lace layer in case I'm feeling a bit more conservative haha. Lastly - Loving being at the office on halloween! They got us KrispyKremes and cupcakes from the Hummingbird Bakery, Yum!! F&F recently got in touch to see if I wanted to be part of their How You're Wearing It feature. They wanted to see what I thought was going to be big this season and see how I’d style it! I picked out this super snuggley and very warm eyelash cardigan. We all know this kind of knit is going to be big this season because it’s so soft and warm and works perfectly in jumper or cardigan form which is great for winter. I've been looking for one just like this for a while but haven’t found one anywhere else. I needed the right length, no buttons and the right colour. Primark do them, just in either green or red, very odd colour choices. F&F have got it right, selling it in neutral wearable colours. It comes in black as you can see here and also in cream. 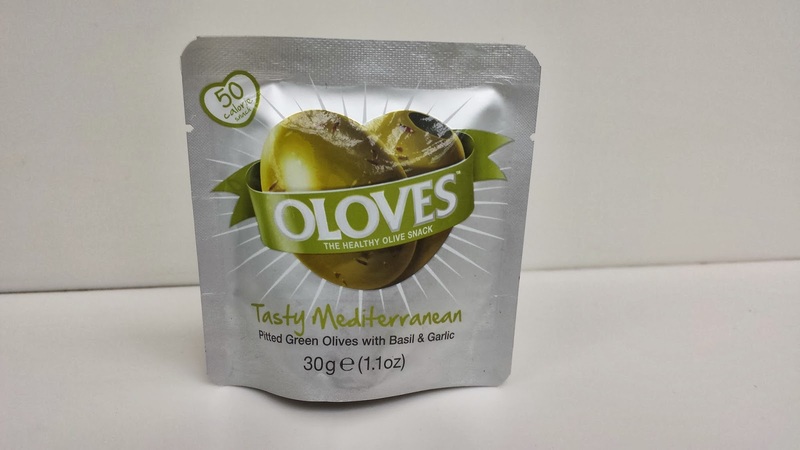 Todays post is a quick review of these olive snack packs called Oloves. 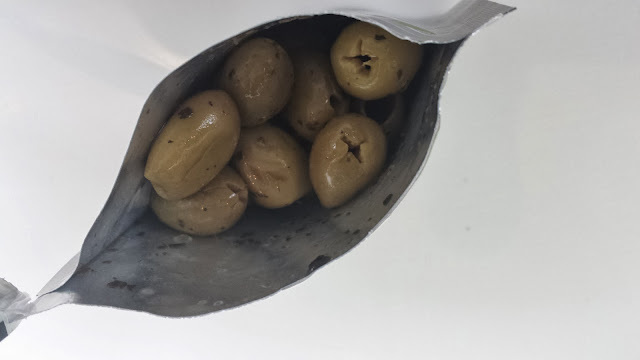 Unlike a lot of people I know, I am a huge fan of olives. I find they seem to be a love or hate kind of thing. My family love them and as soon as we get a jar they get eaten up but my friends hate them and make stupid comments when I order them at Nando's haha. So these little snack packs are perfect for me. I've been bringing them to work with me and having them as part of my lunch. 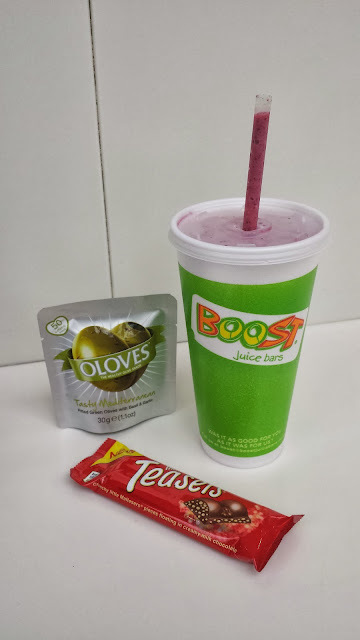 They are just 50 calories a pack which is nearly a quarter of most chocolate bars and they are the perfect size. They come in a variety of flavours and out of these three my favourites were the Mediterranean ones. yum! Are you an olive lover? Nails wraps have taken the world by storm as they are just so easy to use and the results are really effective if they are applied correctly! Lazy Nails are another brand who have bought out their own range of wraps and they now have a super cute Halloween section - I love the little ghosties - they also come in glow in the dark versions! They sell the wraps for £7 and for that you get 16 wraps, a file, a preparation wipe and an orange stick. These are the first set of wraps that I have tried that come with their own orange stick and it's really a great addition to the kit, it's so useful to push down in into the corners. You also get a 9 step introduction page to help with application, although it is preeeetty easy! Wraps are really easy to put on and I'm sure a lot of you have done it already! The best thing about them is that once they're on you can just carry on with you life and not sit around for an hour waiting for them to dry! You can pop them on for Halloween and peel them off the next day when its all forgotten about, easy! I've been toying with you idea of a how you style series for a while now and decided to just go for it. I'm going to try to take part in them as well so you can see how I do/have done it! I had quite a good response to the idea on Twitter and after deciding the first in the series would be VELVET I had a few takers. 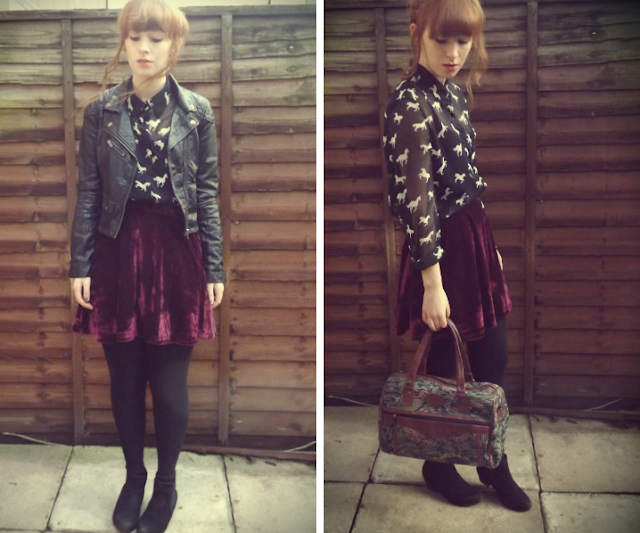 I love to see how everyone styles similar things differently and velvet is an absolute favourite of mine. 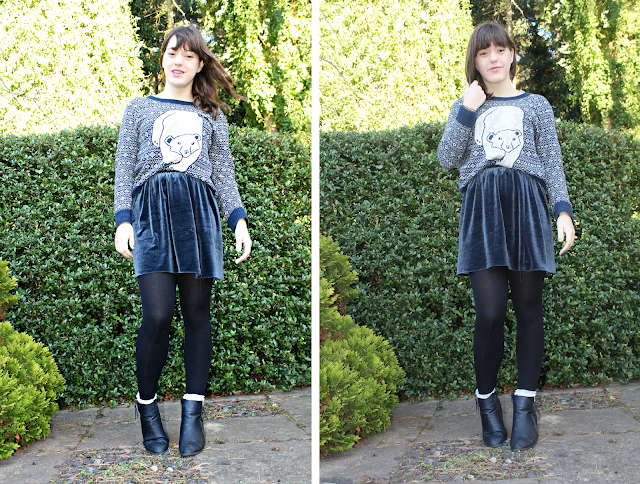 Here are how some other bloggers have styled up their velvet! Ally from www.parisinrain.blogspot.com says - It's elegant, chic and something I would wear to a posh meal out (definitely not something I would walk around town in!). Velvet often makes me think of old fashion female writers and Ladies. So that was what inspired this style I think. 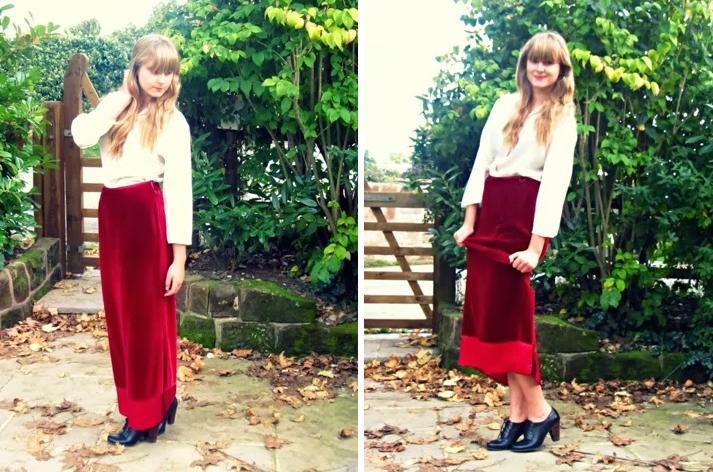 Hannah From http://doodleheart.xblogspot.co.uk says - This picture is from last year but it's only just getting wintery enough to wear velvet again IMO, however, this was an outfit I loved wearing last year. Styling the velvet with studs, silver jewellery, and leather boots toughened it up, whilst mixing in knitwear meant that I wasn't too cold in a crop top! 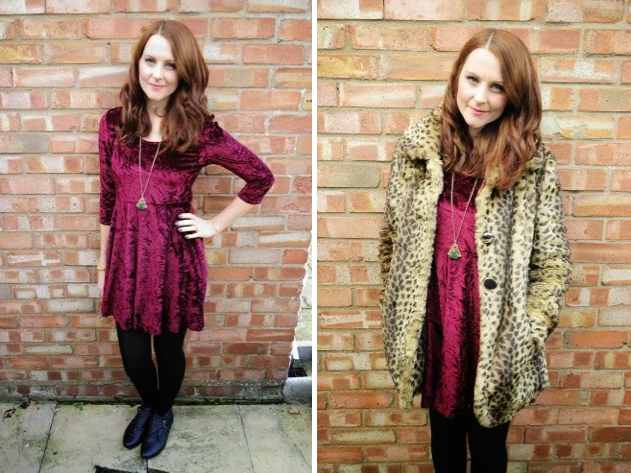 Debs from http://www.bangonstyle.blogspot.co.uk says - I styled up my crimson velvet dress with vintage necklace and studded boots and a leopard fur coat for a bit of winter glamour. Jessica from www.jessicainyourear.blogspot.co.uk says - I styled my handmade velvet skirt with some boots and my favourite chunky patterned jumper for a casual vintage vibe. 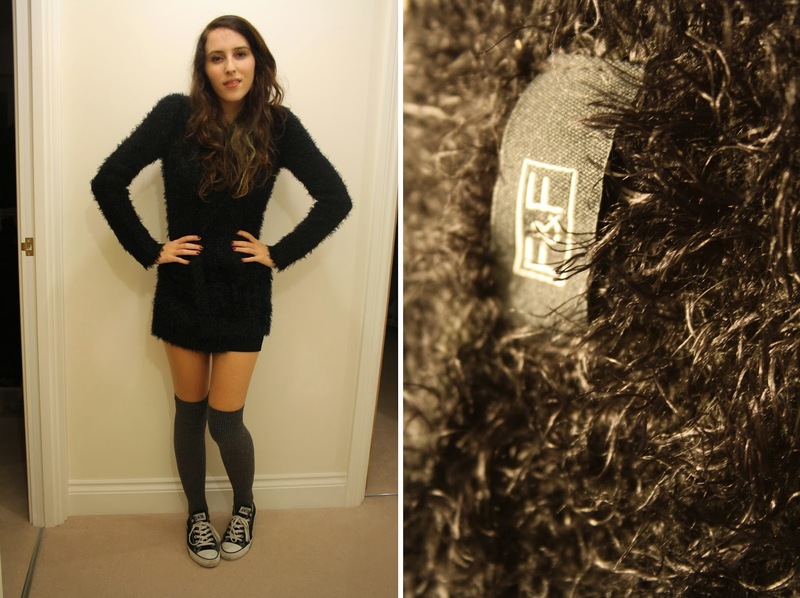 Sian from http://www.rebelangel.co.uk says - I styled it up with a pair of autumn leaf coloured tights perfect for the weather at this time of year. Paige from http://heldtogetherbypins.blogspot.co.uk says - I'm a massive fan of the velvet trend, so when I decided to buy a piece for my wardrobe I chose a red skirt because for me its a classic. I wanted to keep it quite ladylike but at the same time give it a bit of attitude with the leather jacket which I think helps to balance it out nicely. Ive really enjoyed this project so far and am looking forward to doing another one, The next theme is going to be TARTAN as we all know that it's a big trend for this season! If you are interested in being part of my next one, email me - xxgeorgina18@hotmail.co.uk - 2 photos of you wearing tartan plus a line about how youve styled it and you will be up in next post. 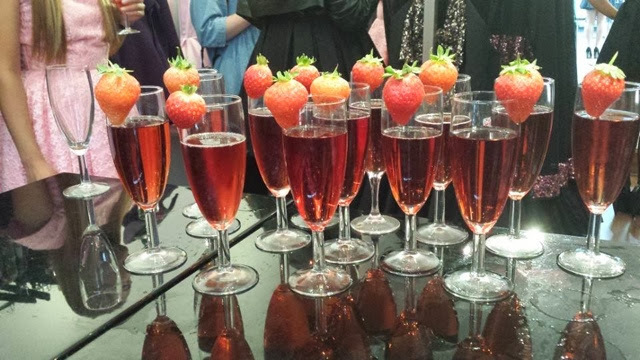 So last week, after work I rushed into Spitalfields (about a 3 minute walk haha) for the Jones and Jones press preview. 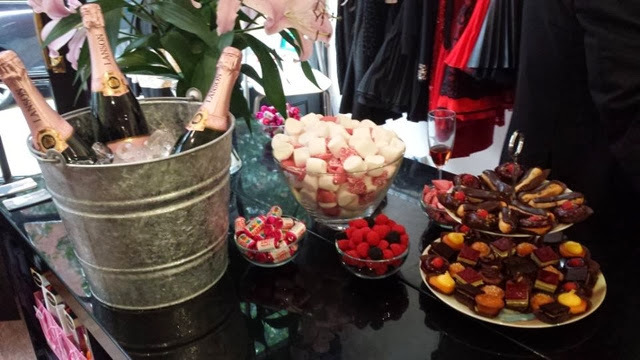 You may or may not know but I am a huge fan of the brand and if I ever have a big family event they are always my first call and always get me loads of compliments! 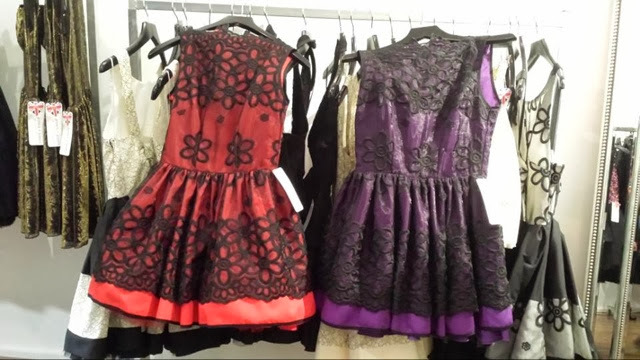 The dresses, as usual are all perfectly made with some of the best quality materials here in the UK. Lovely Teresa told me that they can think up a design, whip up a sample and have it on their website that evening. Amazing! It was lovely to meet Rebecca from itscohen, another Essex blogger who luckily recognised me. For some reason I never ever recognise anyone even when I read their blogs haha we had a lovely chat and looked through the dresses before she had to leave. That's when I decided it was high time to try on some of these beautiful dresses. 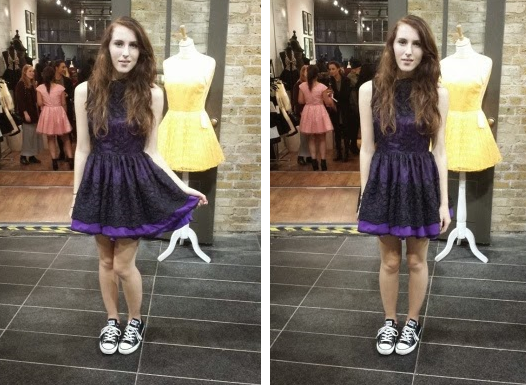 I picked up 4 and whittled it down to two, two of the same dress, just different colours. I loved the lace overlay of them and it is a feature that is missing from my collection! I wanted to like the purple one better because I already have a red one but it was just perfect, it fitted me better, it seemed more puffy too and the brighter colour just suited me better. Isnt it perfect!? Outfit post coming up soon! They have a lot of pink in for such a wintery season but I just love the shade. I'm defiantly not a pink kind of girl but I love the materials and textures of these two, especially the first one! All of these beautiful dresses have the traditional Jones+Jones skirt silhouette which is the thing that I love the most about the brand! Do you have any Jones and Jones dresses? 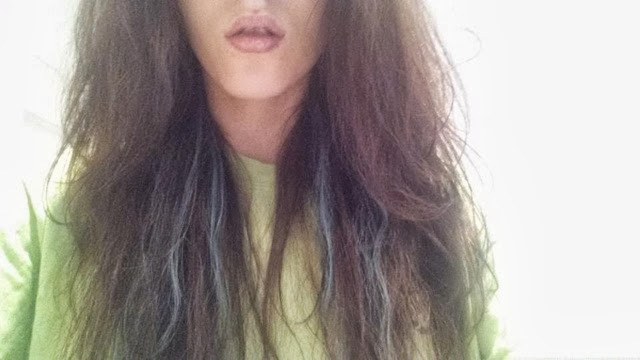 Ok guys so it may not be much but I did dye my hair a little bit on Saturday. My brown needed re-doing so I asked my mum to add in some cheeky blonde strips underneath as well. I'm happy with the outcome and the blonde came out blonde which is always good but I just wish we put abit more in, next time I'm definitely going to add more. This is great for now as its easy to cover and I don't want to get in trouble with my current jobs or any future ones. When my mum had finished up I decided it was time to get some pretty colour back into my hair. If you saw my post here from when I went to the Bleach London home hair colour launch you'll know that they gave me some colours to try. Today I opted for washed up mermaid. 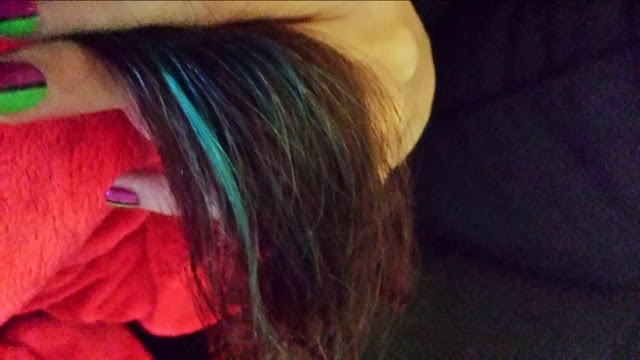 I wanted to try turquoise first as it was my favourite colour when when I've dyed my hair in the past. Although when it fades I've got bleaches bruised violet to try as well as some pinks from crazy colour! The bottle said three thing. 1. Apply to damp towel dried hair, 2. Wear gloves and 3. Leave on for 15 minutes. I didn't end up doing any of those. My hair had just been dried to see how the bleach had turned out and I just wanted to get started. I put on a pair of gloves to start with but it was so hard I just took them off, much easier to spread the dye and feel what's been covered without, my hands did go blue but after a couple of washed it'd all gone. I also thought the bottle said 20 minutes and thats what i did so that one was an accident. Overall I'm very pleased with the colour and coverage and its made me very excited to do more. What do you think? Have you got pretty colours in your hair? Hi everyone, my name's Penny and I’m a lifestyle blogger over at apennyforthem. I’ve been reading Georgina’s blog for a long time now, as well as chatting to her on Twitter and we’ve met twice (once at Essex Fashion Week and then again when we went bingo together the other week!) and she’s a lovely girl. I’m always mega jealous of her figure, her gorgeous hair and her style. She’s a total ‘clothes horse’ and seems to be able to master any style, switching them up from one day to the next. As we all know, she’s quite partial to a crop top so when she asked me to do a guest post for her I thought what better to write about than her passion?? I love crop tops (although I could never wear one as my middle is a bit too round!) and I think they’re much more adaptable than a lot of people realise. You can pair them with jeans, maxi skirts, mini skirts or shorts, or you could pop them on with some smart black trousers or a tailored skirt with a fitted blazer over the top and you’d be office-ready! As we head into winter, crop tops perhaps aren’t the most season suitable clothing, but it’s the perfect time of year to be buying them for next summer, as they’re easy to get hold of at knockdown prices now they’re considered out of season! I’ve been on a spending ban since July 2012 (ouch) but before I started it, I always used to buy my clothes when they were in the end of season sales as they are just so much cheaper, it’s a great way of saving money! Just make sure you’re sensible and don’t buy items that are too time-period focussed, you don’t want to buy something and find it’s out of fashion when the right time of year does finally arrive! I’ve had a bit of a scout around the internet, and here are the best crop tops I’ve found, all reduced from their original prices! New Look - £5.00, reduced from £12.99. Just to give you an idea how much more economical it is to buy items in the end of season sale, all of the above should have totalled £152.95 but at the sale prices come to just £60.50 – much less than half the price!! Bargain! For the record, there are also some fab cropped jumpers available in the current season ranges, so you can rock the crop in winter style! Do you love crop tops and are you brave enough to wear them, or do you just have to admire them from afar like me?